Add kale pieces to a large bowl. Add a dash of sea salt. Using your hands massage the kale to break down and soften. About 2-3 minutes. The kale will turn more of a forest green and smell fragrant, thats when you know you’re done. To that same bowl add, raddichio, mandarin oranges, cranberries, and green onions. Set aside. Heat a medium skillet to medium high heat. Add pecans, brown sugar, and butter. Cook for about 3-5 minutes, stirring the entire time, until the butter and sugar are melted and coat the pecans. Remove the pan and let cool on a plate or sheet of tin foil. In the meantime, to make the dressing, add apple cider vinegar, olive oil, stone ground mustard, raw honey, dry basil, red pepper flakes, salt and pepper to a medium bowl. Using a whisk, mix the dressing together until the oil and vinegar no longer separate. 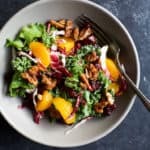 Top the salad with the candied pecans and serve with dressing.